An unmanned Russian Progress cargo ship docked with the International Space Station early Sunday, bringing two-and-a-half tons of supplies and equipment to the lab complex. The Progress M-07M capsule, launched Friday from the Baikonur Cosmodrome in Kazakhstan, docked at the aft port of the station's Zvezda command module at 7:58 a.m. EDT as the two spacecraft sailed 216 miles above western Mongolia. The most recent previous Progress docking in early July was delayed two days because of a commanding conflict that caused the spacecraft to abort its approach and overshoot the space station. Russian engineers resolved that problem and today's linkup was on time and uneventful. 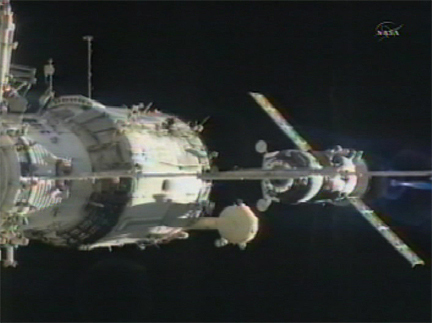 "Everything is nominal," a crew member reported as the Progress closed in. "One meter... and we have contact." "Copy, and we see contact and capture," a Russian flight controller replied. "Congratulations." Progress M-07M, the 39th Russian cargo ship to dock with the station, is loaded with 1,918 pounds of propellant, 2,645 pounds of equipment and supplies for the station's crew, 110 pounds of oxygen and 375 pounds of water. With the cargo craft firmly attached, the station's six-member crew will turn its collective attention to making preparations for the departure of outgoing Expedition 24 commander Alexander Skvortsov, cosmonaut Mikhail Kornienko and NASA astronaut Tracy Caldwell Dyson, who were launched to the lab complex April 2. Undocking from the upward-facing Poisk module late Sept. 23 U.S. time, the Soyuz TMA-18 spacecraft carrying Skvortsov, Kornienko and Caldwell Dyson is expected to land in Kazakhstan Sept. 24, around 2:22 a.m. EDT. Expedition 25 commander Douglas Wheelock, Shannon Walker and Fyodor Yurchikhin, launched to the station June 15, will have the outpost to themselves until Oct. 9, when three fresh crew members -- Alexander Kaleri, Oleg Skripochka and Scott Kelly -- arrive aboard the Soyuz TMA-01M ferry craft.